If you are just getting started in your tiny house dreaming process, or are in mid-build and are running into issues (or anything in between), join Andrew and Gabriella Morrison (creators of hOMe) for an out of the ordinary tiny house workshop experience! Our goal is to support you in every way possible to achieve your tiny house goals. 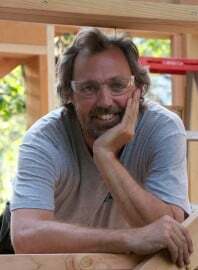 We love teaching others how to build (Andrew has personally taught over 2,000 people in his workshops) and we have seen time and time again that with the right information and resources that even those with no previous building experience can build their own tiny houses. Over the course of two days we will cover everything from trailer selection and design, weight considerations, framing, mechanical systems (venting, plumbing, electrical), window and door installation, insulation, finish materials, roofing, appliances, design, and how to stay safe in your build. We will also cover vital topics such as zoning/code issues, where to park your tiny house, and how to approach your local officials to get your tiny house approved. Considerations such as downsizing, and how to support yourself through the stressful points of the build will also be covered. We are proud to offer over $300 in bonuses to each person that signs up for one of our workshops: the hOMe Tiny House Total Digital Plans Package, the “How To Guide To Building a Tiny House” video series and the “How To Be Your Own Contractor” video series as well. All of these bonuses are available immediately upon the checkout process so that you can start learning right away. The cost is $299 per person and for each extra person that signs up, the total cost drops by $50 to $249 each.